You’ve felt it. Anytime you’ve stomped out of the room, slammed a door, rolled your eyes, sighed in disbelief…they’re trying to get in. Deep down they know they can’t control you – but they still try. The worst part is that you don’t often know it’s happening. But, since no one else seems to be telling you the truth, I will. Because you can actually stop them. How often have you felt like teachers are constantly prodding and pushing you through your day? They are using tactics that fall under the realm of behavior management. Most teachers feel that getting through all the standards is next to impossible without a consistent behavior management system. This may be a system of stickers, tickets, and other bribes or it may be a system of criticisms, threats to privileges, and punishments. The goal remains the same: Control student behavior so it cannot derail instruction and learning. You may feel that teachers can control your behavior, and they certainly try to, but what I want to show is that they cannot do it. You control your behavior. Your actions come from a desire to meet your basic needs. What many teachers and parents are actually trying to do is bypass your brain and get you to respond to a stimulus, like the famous “Pavlov’s Dog,” they are trying to condition you to respond to their requests in a consistent manner as to prevent problems in the classroom. I only taught in the physical classroom setting for one full school year; that year was enough for me. I started off the year going to eat my lunch in the teacher’s lounge from time to time. I couldn’t believe what I heard. Student behavior or parent behavior was almost always at the top of the discussion, and not in a positive way. Teachers and administrators are constantly clamoring for newer and more effective ways of erasing disruptive behavior. Teachers who could manage their classrooms well experienced much more joy in their career and were able to leave work feeling fulfilled. But, the challenges are constantly shifting! Why? Because we are people! We have desires of our own that don’t always align with the teacher’s desires or our parents’ desires for that matter. All we do is behave. Behavior is anything our body does. William Glasser developed a concept called “Total Behavior” which include our actions, thoughts, emotions, physiological responses. He actually strongly held a belief that no behavior is accidental. 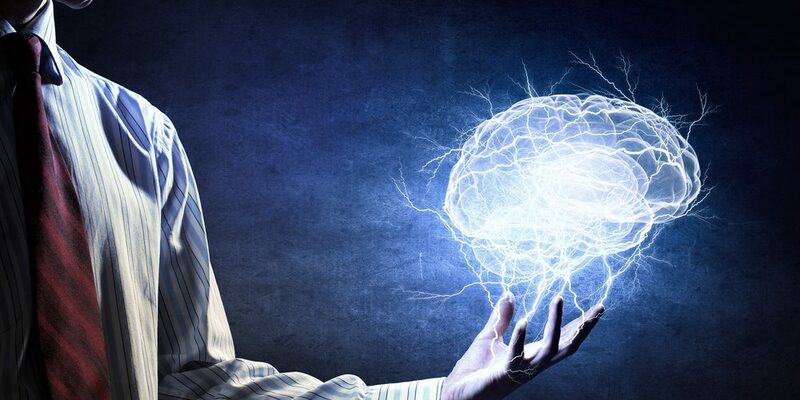 Even behaviors we aren’t aware of are chosen by the brain based on the information the brain receives. You can read all about his beliefs in a wonderful book he wrote called, Choice Theory: A New Psychology of Personal Freedom. You probably most often think of physical actions you do when hear the term behavior. But, for the purposes of this article, human behavior will be defined as thoughts, actions, feelings, and physiological. Glasser explains it better in his book but it helps to know that no single component can act independently. All four components of behavior move together. There may be a component that is more obvious to others, like running. I am running describes only one component of our total behavior. But I am also thinking about things, normally I’m thinking about how far I’d like to be able to go on this run. I’m also feeling things like confidence or defeat. Lastly, my body is sweating, my heart rate is higher, and my breathing is quite different. These four components make up our total behavior. But, we don’t have the same amount of control over every component. Who controls your behavior? Glasser wrote that the only thing another person can give you, regarding your behavior, is information. They cannot bypass, or hack, your brain in other words. I can’t remember if he ever addressed the idea of brainwashing, which I think is quite possible to influence the brain, but the brain can only be washed once it has taken on the information as fact. In other words, your brain has to give permission! You control your behavior. Even your feelings? Yes! Even your physiology? Yes! Wait, what?! You’re telling me I can control my heart rate, my sweating, my lack of focus, and my appendicitis?! Well, it’s not like we can just pull a lever and control those things. Maybe it’s better to say that we have more control over behavior than we first assume. The easiest part I think to understand is the fact that we directly control our thoughts and our actions, like walking, talking, running, sitting, and so on. If you want to think about ice cream, you just start thinking about it! Easy, right?! But, what about when you want to stop thinking about something? For example, let’s say you want to stop thinking about an ex-boyfriend. The more you try to tell yourself to stop thinking of him the more you’ll probably think of him. You will have to start thinking of other things. And, the more experiences you shared in common with this person, the more difficult it will be to remain focused on those other things because you will have reminders everywhere you go. The parts that are more difficult to control are much like the rear wheels of a car. They follow the front wheels. The driver doesn’t directly control the rear wheels but can control them by controlling the front wheels. Our feelings and physiology are much like the back wheels of the car; they follow our thoughts and actions. This experience may not feel the same for everyone but I’ll see if I can try and give an example. I really like to read, especially useful information about our brains and human development. My actions are sitting and reading while I am thinking and connecting my current worldview with the worldview being presented. I often feel content or sometimes excited if I’m taking in a relatively new perspective or understanding my current perspective more deeply. Lastly, my heart rate and breathing are relaxed – on a rare occasion, my heart may race a little based on my excitement. Just in case the image is a little difficult to picture, the above illustration was often used in training by the William Glasser Institute to explain the components of total behavior. 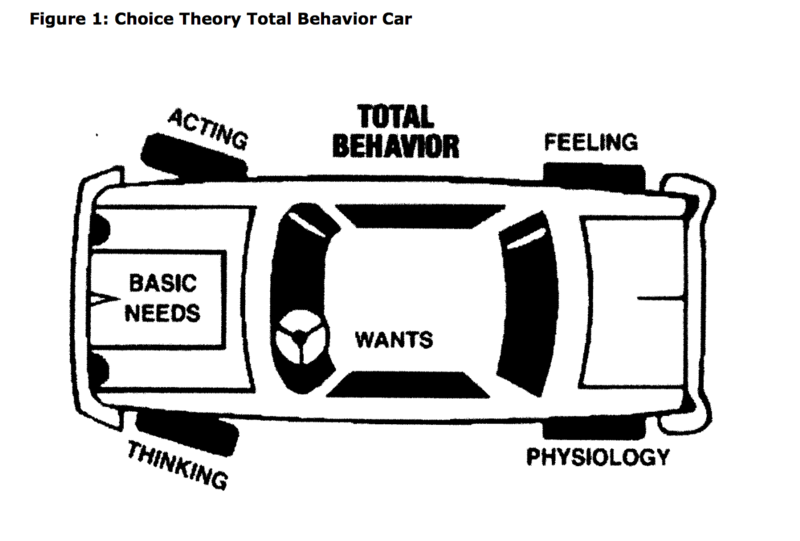 We are all driving through life in our behavior cars. We are driving to meet our most basic needs for survival, belong, power, freedom, and fun; we steer our thoughts and actions toward things we think will meet those needs and our feelings and physiology follow along. Maybe this question doesn’t need to be asked but it’s worth noting that all we do is behave. There is never a time in our lives that we are completely empty of behavior, except maybe in cases of a severe coma, but I’m not qualified to even begin speaking on that topic. Behavior also affects others. The things we do become part of other people’s behavior. The real challenge of life is learning how to behave in a way that meets my needs without blocking others from meeting theirs. When we purposefully block other people from behaving in a way that they feel meets their needs then we are using coercion. Coercion is the attempt to hack another person’s desire in order to control their behavior. You hack their desire; you control their behavior – in a manner of speaking. Desire is like the wind in our sails. If someone can take away your wind then they can heavily influence your ship. What behavior are adults most often trying to control? Learning. When students are learning they are rarely disruptive and the classroom environment is much more peaceful. You might often assume that learning is the same thing as remembering but I don’t think it’s always true. You can remember something without learning about it. Maybe learning does involve memory though. I can more easily remember things I’ve learned. Learning involves thinking…connecting…processing…capturing. Learning is something our brain does. It is action. Imagine for a moment that your brain is a trailer. New information is loaded onto the trailer. In order for our brains to hold onto that information, it must connect the information, or load, to the trailer in some way. If learning is a behavior then no one can learn for you. At some point, your brain has to make that connection. Adults may criticize, nag, bribe, threaten and punish but until you desire the learning, it’s probably not going to happen. In fact, I wrote another article about how these adult behaviors actually block your desire to learn. Even many high schoolers will falsely request that their parents and teachers be harder on them in order to help them achieve. This is useless. But, if that doesn’t work, then how can you finally get your brain to do what you want it to do? Awareness is Key. I can remember being in school and just feeling completely bored to tears…okay, not literally to tears, but bored. I would whine and complain and toss and turn in my chair. I actually wanted to do well in school, just like most students do. I just couldn’t get there. So, if learning comes through desire first, why did I struggle? Why did I graduate near the bottom of my class with a 1.9 GPA? What part of my school experience did I actually desire? Was paying attention in class fulfilling my basic needs? Again, probably not. It was not until I went to college as a 26-year-old man that I was able to turn my desire into effective behavior. I didn’t just want good grades. I wanted to learn. I wanted the knowledge that teachers were explaining. I listened, I took notes, I studied, I asked questions, etc. These behaviors all worked together to help me gain new knowledge and perspectives, and I graduated with a 3.79 GPA this time. You can develop awareness by paying close attention to what your desires are. Think of your goals in life. What do you actually desire? Get your parents off your back? Why? Understand and articulate why you’re behaving in the way you are and then try to evaluate if it’s helping you get what you want. Write down as many of the behaviors you can think of that you’re doing. Then begin to look at each one and ask, “Is this helping me get closer to my goal or is it hurting me from getting closer to my goal? If self-help books have taught us nothing else, desire is just the beginning. It’s not enough to desire anything. We must put that desire into action. What I’m adding here is that action isn’t enough without an awareness of what you can control. If you go through life believing that other people control your behavior, it’s going to be very difficult to find success. No one can hack your brain without your permission. You control your thoughts and actions. Please let me know how this article has impacted you! Find me online, email me, message me…I look forward to our conversations!